These are just a handful of upcoming and past appearances. I do have many more appearances in mind this coming year, to be announced – and my mind is so fuzzy on the older ones, so I’ll add them as they come to me. I’ll also update a lot of this with proper links gradually over the coming weeks. “The Low Life” at Ice Cream Gallery and Toys in Grand Rapids, MI. Ongoing. “Steampunk Symposium“ at the Crowne Plaza Cincinnati North in Cincinnati, OH. April 26th through 28th, 2013. “Urban Lights Holiday Market“ at Ice Cream Gallery and Toys in Grand Rapids, MI. December 8th 2012 from 12PM to 9PM. Artprize 2011 – (Guest and Exhibitor) at the Gerald R. Ford Museum in Grand Rapids MI. 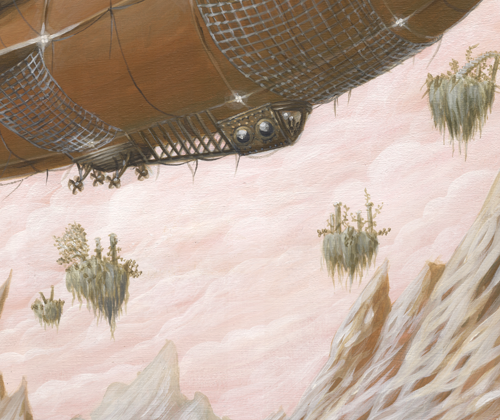 This is one of my three final commissions for this year, meaning I have two more to go before this series is done and I can finally start lay-out for the “Airships and Tentacles” book. These have been rather slow-coming – I’ve been chomping off bits of my work list, and well, between home repair, prepping for coming conventions, keeping food on the table (web/programming work), shipping, and *still* catching up on kickstarter stuff… it all feels like ‘nibbling’, though I haven’t slowed down or stopped in nearly a year. I have it imaged at 600DPI, to ensure that these details show as well as the original in printed form, and those prints are now available HERE. There are only 10 available, they are printed on canvas at the exact same size as the original painting. As an early buyer incentive, the first two to sell are available for only $190; They’ll go back up after those two have sold. Yo Ho Ho and a Bottle of …Gin? Hendrick’s Gin is giving away a custom box, made by me, including an original painting, 11 giclee prints on acid-free paper, a 14×11 metallic print, my Coloring Book for Grown Up Kids, and a copy of Insects and Angels Magazine. 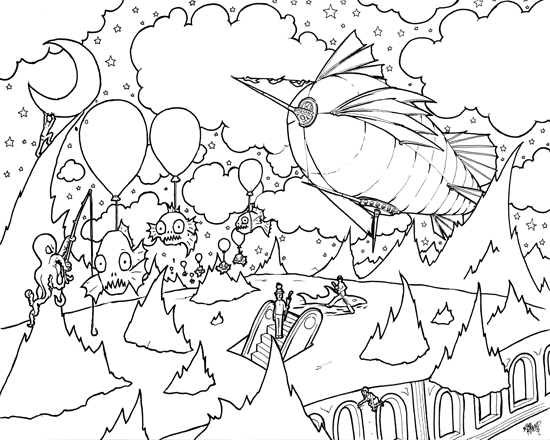 A coloring page – something to confuse the little ones in a good way, and promote a bit of thinking outside of the box, while introducing them to some elements of classic artworks as well. 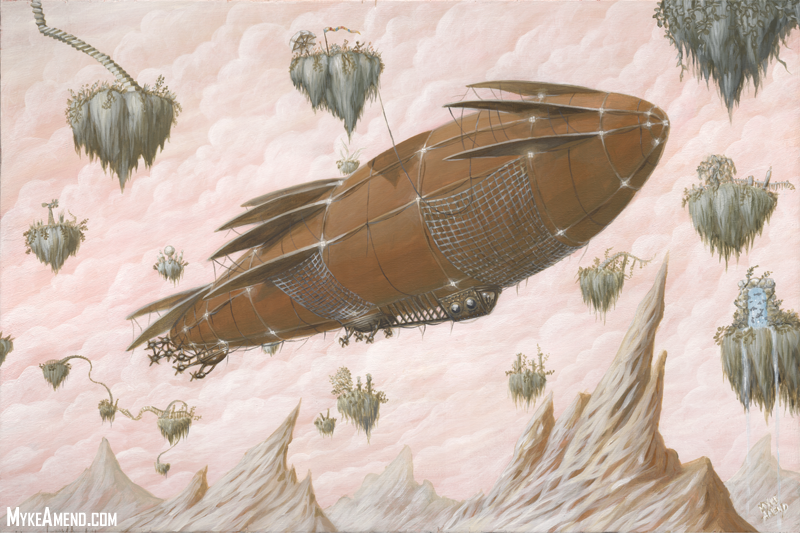 Yeah, I know, people have gotten pretty used to me making with the fantastical steampunk stuff – but there are a lot of times when the things in my head aren’t exactly in the genres I’m known for, often times these things aren’t exactly things people would want hanging on their walls, or even like. I took a 6-month break from showing anything new here – not that I stopped creating, but I was building big things, painting big murals upon them, working large scale in everything from the art itself to the undertaking as a whole… I managed 7 new paintings – each 3 foot by 7 foot, and can’t show them right now as I have no budget for imaging them. I’d like to say I am working on something even bigger than that, but I am working smaller for a bit – less over the top, less fantastical, less with the huge. … Some of this, is because the project, and all that time, really tapped me out emotionally, physically, and otherwise – I may have shot my life completely down the tube, I don’t know – I’ve lost my faith in humanity save for a small handful of people I met and worked with during the process, and have lost all hold on any illusion that there is any hope for a real arts scene or art happenings in the town I am currently living in and my thoughts in general on art as a living: expletive filled and feeling rather final. I guess I still have to do whatever I can do, manage whatever I can manage, every day, regardless – so I do what I can do, which is painting, on what I have available to paint on. I’m finding bits of board and unused canvas around the house big enough to do paintings on, and painting away for no one and no reason in particular. I think some might call this “freedom”. 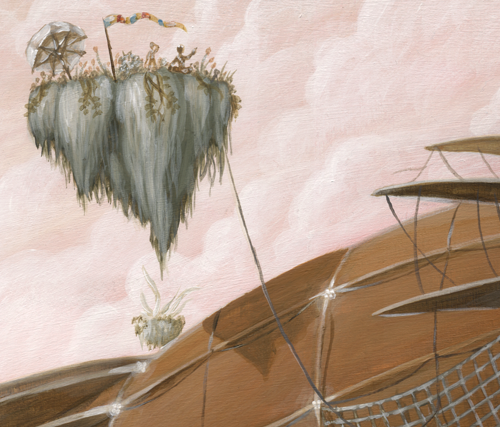 If you liked the sorts of things I spent the last few years painting – well, there were ways to express that – Just downloading images, wasn’t it. But, for those who missed all the oddness and ugliness… well, it seems that I am back in that regard, and will paint new things, whenever I feel like it, whenever I have stuff to paint on. I’m not done being an artist – I was born that way, I’ll die that way – I am just feeling rather done with *this*. I am going to go back to breaking my back for a living, because I’d enjoy that a lot more than watching the internet for a non-living. I am going to wrap all my works up as I make them, store them up, list a few here now and then, and show them if and when a chance to show them someplace good comes up. My latest two pieces are painted on 8×10 inch scraps of birch. They are filled with tiny details. They are the product of free-painting, with no particular image, story, or anything in mind short of the current element leading into the next and tying in with the previous. I suppose this is leading a lot more toward the style of my older, more surreal works, and I am exploring that for a while… contemplating how I will break that formula on the next, reflecting on missed chances in the previous…. building toward something, though I have no idea what, nor do I care. I’d say more, but I still feel that people who like to talk a lot about their work, should be spending that time working. This post is for those who are aspiring artists, those who are living the artists’ life/fighting the good fight, those want to know what the typical artist’s life is really like, those who erroneously assume we are on some pedestal above the working class, and especially those who see us as something lesser than the hard-working masses. I really enjoy what I do, and I enjoy every person I interact with online, and every person I meet at shows and conventions along the way, when we are able to make conventions anyway. – Some people mistakenly think that being an artist means not having to work – joyfully stroking away at a canvas with a very long brush so we can still recline in a golden hammock, while dining on peeled grapes and supervising our apprentices to urinate more passionately upon a silk-screened soup-can. – Others assume that being an artist means not wanting to work, as if we spent all of our days on play and recreational drugs, and only picked up a brush to avoid “real work”, or maybe just to have something to offer for money… like that guy on the corner offering to sell you a handful of dumpster findings from his pockets, because he knows you’d rather just give him 50 cents. Now, I am talking actual artists here: Not those jet-setters who would gladly have fame rather than create something worthwhile – Not those coke-headed scenesters to whom “art” is rubbing elbows with the wealthy over champagne while conversing about the deep and existential meanings behind sloppy paint on a half-assed doodle ready-made to satisfy the “chic” galleries’ demand that an artist produce 12 pieces a month to be considered – Not the “I’m gonna splatter this paint on a canvas” guy you see making a living off 5 minutes work per $50 painting (or sometimes $4,000,000 painting). … No, I am talking about those who couldn’t live without being able to create things worth being proud of, and would gladly die of starvation or lack of sleep if it meant finishing that one last work… which in its conception and crafting is nothing short of amazing, but completed, will never, ever be good enough, but always one step closer… while never anything worth patting oneself on the back over. Even a step backward is a step forward, every failure is a triumph. We learn through experience, improving our art through noting the good and the bad – and for all the works you’ll ever see, are at least three that get crumpled, scrapped, abandoned, burned, or shot and buried ceremoniously. Artists included – Any of us who struggle to work for ourselves, are the most tyrannical of bosses – We typically spend 16 to 36 hours at a time on our work between 4 to 10 hour naps, grabbing a shower or a bite to eat when there isn’t an important deadline to meet, or paint threatening to dry on the pallet. (I’ve managed over 150 hours of straight-painting in my worst/best days – bathroom breaks and Mountain-Dew refills excluded). On the very best days, those hours are spent on art alone, though those days rarely come – so the days get longer and longer, bedtime gets that much further away, just so some actual art can be managed before “day’s end”..some 48 hours later. If we are doing well online, much time goes into ordering tubes and packaging, ordering prints, wrestling with cardboard and glue to make painting-shaped boxes, rolling prints, printing labels, signing things, making certificates, running to and from the post office… it keeps us from our work, but it is happy work. Sending my art to hang in the home or office of another person keeps us going, emotionally and financially. The rest of our time is spent writing blog entries, redesigning our sites, managing our “social” network pages, creating sales, adding new products to the web, looking for affordable advertising, logging clicks and cost, submitting to boards and sites and magazines, answering our email, waiting for others to answer theirs, looking for new markets or merch like skins and tattoo flash and tee shirts and such, and doing work for others to make ends meet: Web design, ad design, various other things “artistic” which are not “art” and often soul-sucking – especially that every hour spent here, could have been another hour of painting. Things being what they have been these years, we spend more and more time on the latter, less and less time on the former, and all those extra hours of tearing our hair out and staring into this screen, mean bedtime is that much further away if we are to get any actual painting or drawing done… because an artist who does not create, is not an artist, but a “seller” if they are so lucky as to be making sales in that time. And when things suddenly go well… due to some freak internet occurrence, some kind soul with a lot of traffic posting our images, or numerous kind souls posting the same to their friends, Tumbling, Stumbling, Tweeting, whathaveyou, or just the purchase of an original work: When we have shipments out of the way, if we have money left over, what we don’t re-invest in replenishing our art supplies – we use to allow ourselves time for our very best days: A worry free day or week of making more art, maybe sleeping and eating more regularly… maybe even putting ourselves on the list for a convention. … and for those days of pure art, still working most of the day, we feel like kings; It boggles my mind to see these people who get huge funding and fame for their art, and could actually bear to spend their days just riding out that fame, when they could be using all that money and attention to make bigger and better art… and not just things that will sell or grab headlines simply because a famous person made them. Truth be told, if art were not so incredibly important to us, we artists could live far, far better begging on the street, or even working a minimum-wage job. We are in a class below “poor”, and often looked at as much less – though we don’t get government money to sit on our butts, no medical coverage, no paid rent, no food stamps, no $5,000 EIC for making babies we can’t afford … Instead, we *choose* not to be a burden on society, we *choose* to overwork ourselves to death, and do so for much much less, and a lot of nothing in between. We live on caffeine, adrenaline, will power, and most importantly the hope that all of our hard work will someday mesh with the American dream: That determination and sacrifice will pay off in the end.. knowing that having spent years of your life on this pursuit, that giving up now, or tomorrow, would render all that suffering and struggle pointless. We are thrilled to be able to justify $8 on drive-thru food we don’t have to cook, being able to spend that time instead on art is like Christmas for us… the same goes for trading blown-out boots for the next 2 years’ “new pair” or getting a pair of glasses that are less scratched-up in order to struggle less with the painting. We drive a car the mechanics gave 6 months to live, and have done so for 3 years waiting to have $350 that does not need to go to bills or art. We pay for our medical expenses out of pocket – and just hope for the best on anything we cannot pay for: Abscesses, unknown pains, troublesome coughs, broken bones if they are not compound fractures. … Really, If I haven’t just cooked up the last breast of chicken and the last egg in order to make sure the cats are fed, or if I am not stressing over catching us up to “$nothing”, it is a pretty good day… yes, I live on the brink of homelessness – and I work very very hard to live on that brink. For all of our work, despite the amount of homes that have our art hanging in them (including those where the art was paid for), or how many people know us online, or how many places you can find us, or the appearance of our web sites, these hard-working artists are really lucky to make $1 an hour for their 100+ hours a week. … And I hope I die never knowing what it is to give up on my dreams. If that is sooner, or later – then I hope the the latter as I am not yet where I want to be with my art. Though I don’t think I will ever be satisfied with what I do, I know that choosing comfort or even life over art is death for me. … and I suppose, *yes*, that does make me “successful”. – If you are another artist and maybe looking for some clues on how to survive “the Great Art Depression”, it is pretty simple: The secret to survival is to not give up and die. Those businesses who made it through the 1930’s Depression, came out on top, and remained there for the rest of the century. – If you are not an artist, and I have provided some level of understanding, or if you simply agree – Please take the time to add to the success of the creatives you appreciate seeing work from. Buy a CD, buy a book, or an e-book, watch a program and wait through the commercials… And though some of the art you enjoy may be a bit dark or crazy for your walls, do something more than just setting a desktop image. Maybe this means giving them $1 – not as a handout – but in appreciation for the millions of hours of thankless work and study they invested into just getting to the point where you can enjoy an image – or maybe this means telling a few others about their work.. stumble, tumble, blog, do *something*… become a part of the creative process, a part of history, by tipping the scales in favor of what you like to see, hear, or read.